Description: As used by Brian Lara. 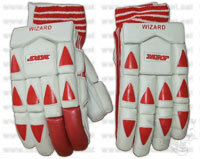 Top of the range batting gloves made from best grade leather palms with artificial uppers, 3 split finger design for extra flexibility and secure grip, extra protection on the first two fingers of the bottom hand, leather cuvettes over the finger ends and the super soft comfort upper foam layer. Possibly the most feature packed and comfortable gloves on the market.